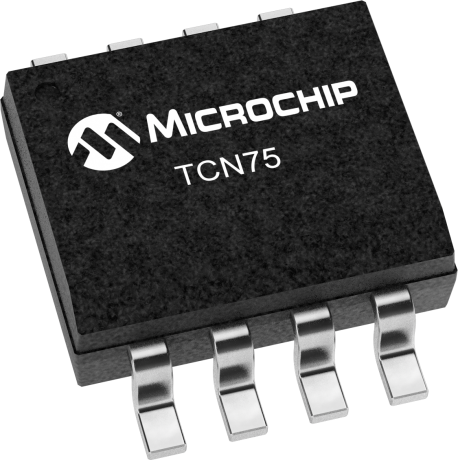 TCN75 is a serially programmable temperature sensor that notifies the host controller when ambient temperature exceeds a user-programmed setpoint. Hysteresis is also programmable. The INT/CMPTR output is programmable as either a simple comparator for thermostat operation or as a temperature event interrupt. Communication with the TCN75 is accomplished via a two-wire bus that is compatible with industry standard protocols. This permits reading the current temperature, programming the setpoint and hysteresis and configuring the device. The TCN75 powers up in Comparator mode with a default setpoint of 80°C with 5°C hysteresis. Defaults allow independent operation as a stand-alone thermostat. A shut-down command may be sent via the 2-wire bus to activate the low-power standby mode. Address selection inputs allow up to eight TCN75's to share the same 2-wire bus for multi-zone monitoring. All registers can be read by the host and the INT/CMPTR output's polarity is user programmable. Both polled and interrupt driven systems are easily accommodated. Small physical size, low installed cost and ease of use make the TCN75 an ideal choice for implementing sophisticated system management schemes.